Nara never disappoints. I am telling this based on my travel experience. Have you ever been to Nara before, especially during autumn? If you have not been there, this post reveals the places you should discover in the fall. There you can witness and discover some of Japan’s famous autumn leaves spots alongside the historic landmarks such as Todaiji Temple, and Horyuji Temple. When autumn rolls around in the prefecture, it’s just fascinating to see how the area itself gets painted with thousands of vividly colored trees. I myself think that Nara’s fall foliage experience is exceptionally breathtaking, and a visit to this area seems to me like stepping back in time. Nara Park in the fall. Photo Credit: sunnywinds* at Flickr. Besides, seeing hundreds of freely roaming deer in Nara Park does not make your trip memorable but also teach you a great lesson why every living creature in the world should be treated with loving-kindness (metta). Indeed they are so friendly and charming. How dare you visit the park without showing any loving-kindness to them? Nara is an ideal place for a perfect day trip from Kyoto and Osaka. Anytime you visit either Kyoto or Osaka, make sure that you gladly pay a visit to this oldest capital city of Japan, not just to admire its seasonal beauty though, but also ancient treasures. A 2-day trip to Nara is recommended to see all the fall colors spots, though I think you will be just pleased seeing few of them within a day. The best fall foliage colors in Nara prefecture can be seen between late November and early December. However, it’s time to dive into the sea of colors! Deer – the symbol of Nara Park. Photo Credit: coniferconifer at Flickr. The city of Nara in the Kansai Region never fails to fulfill your expectation. You are offered to do lots of things to do and lots of things to learn visiting the historical attractions. Being here in autumn is particularly special, as you get to experience a wide range of fabulous things. With beautiful temples & shrines, gardens, museum, ponds, Buddha statues, impressive trails, and hundreds of friendly and free-roaming deer, Nara Park (1,600 acres) is considered the best tourist attraction in Nara city. Among the eight UNESCO World Heritage Sites Historic Monuments of Ancient Nara, it encompasses four such as Todaiji Temple, Kasugataisha Shrine, Kasugayama Primeval Forest, and Kohfukuji Temple. Nara Park during autumn. Photo Credit: Wikimedia Commons. There is nothing like a beautiful park to get me excited about traveling. Every time you make your way to this park, you will be fascinated for sure. Unlike other park you find elsewhere in Japan, Nara Park is different. This is neither a zoo or nor a traditional looking city park, instead you can simply call it a sacred place to be dazzled by its beautiful surroundings and historic structures. Maple and other deciduous trees that are found on its spacious grounds are ablaze with colors in autumn. To prove it, I want you to visit Nara Prefectural Government Office Building and enjoy the beautiful autumn surroundings from the rooftop. Besides, take a walk into the park, and feel the autumn atmosphere by gazing at the vividly colored trees. In search of best sights of red leaf, you can take a walk along the paths of the momiji-lined canal and witness many gorgeous maple trees. The walkway to Kasuga Shrine is the best to walk along because it’s lined with hundreds of stone lanterns including giant trees. Some of the trees actually turn color in the fall, and they obviously look fabulous at the time. The path to Kasuga Shrine! Photo Credit: Ray in Manila at Flickr. Along with seeing stunning fall color vistas in the area, you would also love to discover the historic treasures of each structure. To do so, I want you to head toward Todaiji Temple. Before you enter the main hall, you will be greeted by the Nandaimon Gate and freely roaming deer. The main hall of Todaiji Temple houses one of Japan’s largest bronze Buddha statues (15 m tall). In addition, you must visit Nara National Museum, and Kohfukuji Temple and its Five Story Pagoda. Each of this treasure tells you a different story. And if you have enough time then don’t you bother to take a walk along the trails through Mount Kasuga Primeval Forest. The Daibutsu in the main hall of Todaiji Temple. Photo Credit: Guilhem Vellut at Flickr. I also want to add two more attractions here: Isuien Garden and Yoshikien Garden. They are located adjacent to each other and both have their unique Japanese garden elements and views. Whatever mood you are in, you would always like to witness these two beautiful Japanese gardens’ incredible autumn vistas. The trails of these two gardens are always a joy to take a leisurely walk. I believe feeding the deer in Nara Park is an enlightening experience. Therefore, don’t bother buying some deer crackers (shika senbei) for the adorable deer who accompany you on the journey, who in fact will share with you a peaceful moment for a while. The nearest station of Nara Park is Kintetsu Nara Station, from where you take a walk for about a five minute to reach your destination. Incredible autumn colors beauty of Muroji temple. Photo Credit: nara-yamato.com. Let me introduce you a sacred place now; better call it a temple though. Located in Mount Muro (Muro-yama) of Southeastern region of Nara Prefecture, Muroji Temple is a beautiful mountain temple with an eye-catching Five-storied Pagoda, hundreds of years of temple buildings, and ancient Buddha statues. The temple is known for its thick forest, Shaka Nyorai, Nyoirin Kannon, Kon-do Hall, Miroku Bosatsu, Five-storied pagoda, and autumn leaves. Please note each of the temple building is surrounded by old forest making the area tranquil and quiet. It is believed that the temple was built in the late 8th century after five monks offered a prayer on the mountain for the Emperor Kammu’s recovery from illness. This is without question a perfect place for Buddhist monks to practice Buddhism. It also provides them a tranquil environment to concentrate their mind in deep mediation. A perfect autumn vista! Photo Credit: TANAKA Juuyoh (田中十洋) at Flickr. Each trail of the temple grounds that leads you to discover its temple buildings has its own style of beauty. When you take a walk through the designated trails, you can expect to see many flowers and picturesque green vistas in the spring and summer. While one the other hand, in the fall, you have to be ready to be dazzled by Mother Nature’s fall foliage display. It does not matter whether you visit it in spring or autumn; you will always enjoy its spectacular views of the forest. Indeed the trails are steep, but passing by the giant trees along the trails is absolutely enchanting! Everywhere you look around, you will see something pretty to be astonished by. If you are inspired and planning to spend a day at Muroji alongside visiting its neighboring temple “Hasedera” then hop on the train at Sakurai Station to Muroguchi-Ono Station, and again take the hourly bus to Muroji-mae bus stop. The entire journey by train and bus shall not take less than 15 minutes each. Tourists enjoying the scenery from the wooden terrace. Photo Credit: Wikimedia Commons. 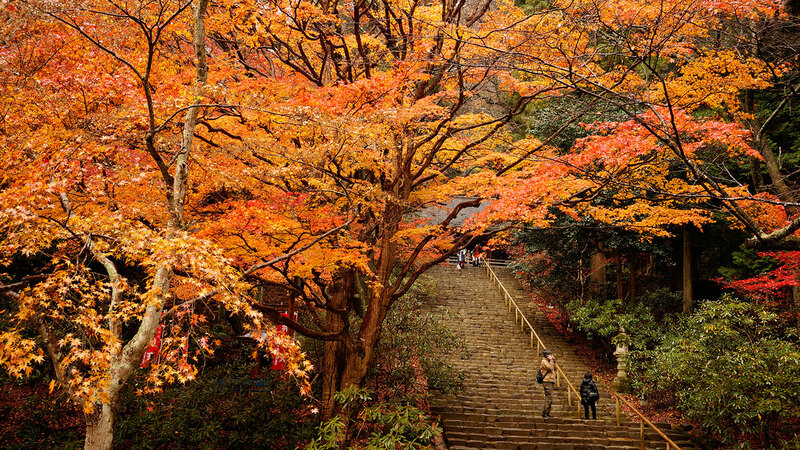 Founded in 686 by Emperor Tenmu and located in a valley in Sakurai city, Hasedera Temple is an important Buddhist temple and said to be one of the most popular fall foliage spots to enjoy momiji in Nara Prefecture. It’s the head temple of the Bunzan sect of Shingon Buddhism. The temple is also renowned as one of the most important Buddhist pilgrimage sites in the Kansai Region. If you visit the temple in spring and summer you will see abundance of peonies, and hydrangeas. The main hall of the temple houses an important cultural property known as the Kanzeon Bosatsu (Buddha of compassion), and believed to the largest wooden Kannon statue in Japan. The staircase of Hasedera temple. Photo Credit: Wikimedia Commons. Have you ever been to Kyoto’s famous Kiyomizudera Temple? There is a large wooden stage for visitors to enjoy the beautiful surroundings of the temple grounds. Same sort of wooden terrace/corridor can be found at Hasedera Temple’s main hall. You have got to go there to enjoy magnificent view of autumn leaves and most of the temple buildings scattered on its hilly grounds. Indeed, the sights from the terrace look very awe-inspiring, especially when the surrounding trees turn colors in the fall and cherry bloom in the spring. Hasedera temple is only a-15 minute walk from Hasedera Station on the Kintetsu Osaka Line. 13-storied Pagoda of Tanzan Shrine and surrounding fall colors. Photo Credit: coniferconifer at Flickr. Earlier I told you that “Nara never disappoints”. Anywhere you make your way to, something incredible would appear in front of your eyes. Nara is a place of many sacred Buddhist temples, but this time you are presented a shrine here, called Tanzan Shrine, located in the mountains south of central Sakurai city. It enshrines Fujiwara Kamatari, the founder of the Fujiwara clan. It was built during the time of the Asuka Period in 678 as a Buddhist temple. At the time it was called Tonomine Temple. But during the Meiji period the temple was converted into a shrine. Combining traditional Buddhist and Shinto charm with natural beauty, Tanzan Shrine offers various outdoor activities for nature lovers. There you can discover many historical structures including the Main Hall and 13 Storied Pagoda, which are designated Important Cultural Property and National Treasure of Japan. Impressive fall colors view from the balcony of the main hall. Photo Credit: imissdaisydog at Flickr. There are approximately 3,000 maple trees can be found on its spacious grounds. In the fall, they all look gorgeous with their vividly colored leaves. In order to enjoy the colors, you can walk into the grounds of the 13 story pagoda, and go up to the balcony of the Shrine’s main hall. The balcony itself features some amazing hanging lanterns! For a perfect leaf-peeing trip including a little bit autumn hiking, you must visit this awesome shrine. The best time to enjoy the autumn foliage here is between mid November and late November. You have to walk 3-5 minutes to reach this shrine from Tanzan Shrine bus stop. I believe the above mentioned spots are the most famous to see autumn leaves in Nara Prefecture. There are other beautiful places where fall colors can be enjoyed throughout the prefecture. Thanks for reading.